This quick video will give you an overview of the Amazon GameCircle API. 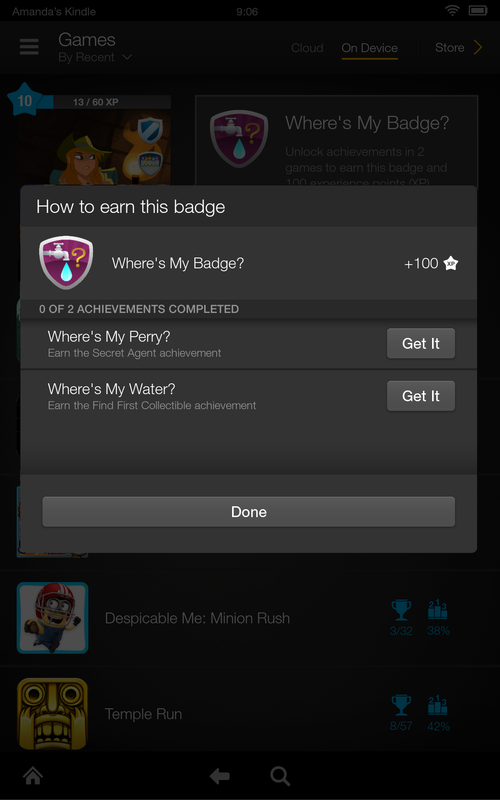 It will cover why developers should use GameCircle, how Whispersync for Games helps preserve player progress between devices, what experience points / cross-game achievements are, and cover the process for viewing engagement analytics through GameCircle’s Achievement Reports. Whether you are completely new to GameCircle, or have achievements already integrated into the existing gameplay of your app, this video will provide you a quick introduction on how to increase player engagement, improve retention, and enhance the customer experience. If you followed along from the first part of this series you should be up to speed on how the Unity IDE works. In this post we will dig deeper into the code side of things. I am a big fan of C#, and while Unity Script is useful, eventually you will need a little more flexibility in your code. So, to help you along, I thought it would be valuable to write a quick primer on working with C# in Unity, as well as some of the most common APIs you will be using when we build our game. 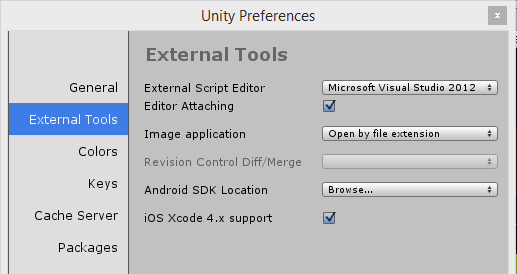 In order to code in Unity you will need to pick an external editor since Unity doesn’t have one built in. By default, Unity ships with MonoBuilder, but you can just as easily switch it out for something a little more robust, such as Visual Studio if you are doing your development on Windows. Simply go into the Edit > Preferences menu and change the path to the external editor. Once you have picked an editor you like, you are ready to start coding. In this post, I will be showing the code from Visual Studio, but MonoDeveloper will work similarly to Visual Studio but on Windows and Mac. You can learn more about the different types in the C# reference docs at http://bit.ly/1bwLAKW. The next set of building blocks is Array and List. An Array is collection of multiple variables, usually of the same type. This is what we would call a generic List. The term generic refers to a dynamic type we can assign at runtime. Generics are a core part of the language, and something you should get familiar with as you gain more experience coding in C#. In this example, we can create a list with a type of Int. Now this generic list can contain whole numbers. For performance, you will want to use lists over arrays when you don’t know the exact size of the data and expect to be adding or removing values at runtime. An Array by contrast has a set number of items you can have in it and shouldn’t attempt to modify the length at runtime. One quick note is that you see I am calling Debug.Log. This will output the value to the console window. C# takes full advantage of classes, interfaces, and a host of other ways of packaging up code for reusability. Unity itself is built on a very easy-to-grasp composition system, which it favors over inheritance. Let’s look at how to make a simple class. Go to the Create menu and select a new script. As you begin to create a new script, you will notice you can select from the three built-in languages. Select C# and call the script HelloWorld. As you can see, you won’t need to memorize how to create a class from scratch, so I will simply focus on two main parts of the script: the import block and the methods. By default, each new class extends from MonoBehavior. There are numerous methods you can take advantage of, but we’ll start with the first two: Start and Update. Here you can see we are using the Debug.Log method again, and we are accessing the first and second values of our list. It’s important to note that arrays and lists are 0 based in C# just like Java, AS3, and JS. Now we have a script that will output Hello World to the console tab on each frame, but we don’t have a place to put it. Go back to the Scene and select our camera. From here, scroll down to the bottom of the Inspector panel and select Add Component. 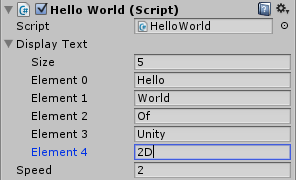 Now select our HelloWorld script and it will attach itself to the camera. Now, if you run the game and look at the Console tab, you will see Hello World outputted on each frame. As you can see, we have taken the transform position property and are modifying it with a new Vector3 that contains our speed value and is multiplied by the Time.deltaTime. 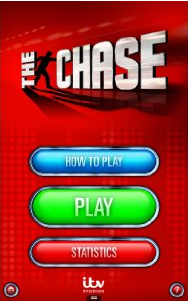 If you simply increased the x position by speed, you are not taking into account any slowdowns in the game itself. By using the delta between each frame, you are able to keep your movement consistent from frame to frame, regardless of dips in the frame rate. This isn’t a magical formula; all it means is that your GameObject will move at the desired distance over time. So if the frame rate drops, movement will look jerky but won’t slow down or speed up as the FPS naturally fluctuates based on other things going on in the game. If you run the game, you will see the camera move. 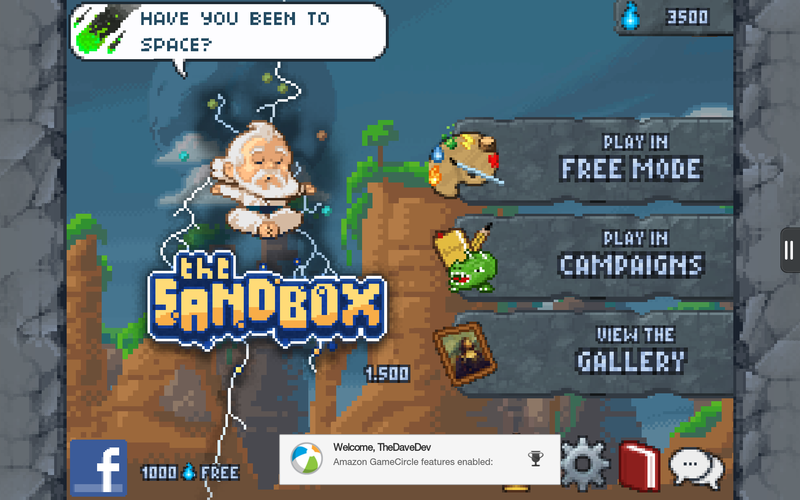 It will appear like the box that we created earlier is simply scrolling off the left side of the screen. 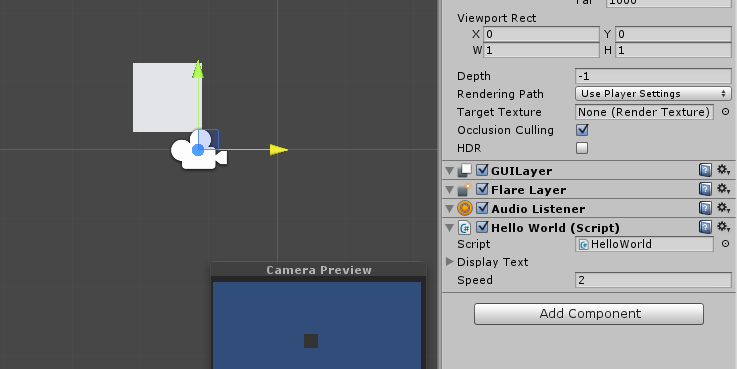 Stop the game and take a look at the camera’s Inspector panel. If you scroll down to the script area, you will see we now have a new input field called Speed we can alter. This is an important concept in Unity. Basically, any public property on a script can be edited from the IDE in the Inspector window. So, while it’s important to create default values for your properties, just know that you can alter those values on an instance-by-instance basis, and even temporarily at runtime when you are debugging. This is incredibly powerful and something we will be taking advantage of later on. Not only does this work with simple properties, such as Strings, Numbers, and Booleans, but it also works with collections, such as Arrays and Lists. If you remember back to our first example, we had a list called displayText, which we also made public. You should see it in the Inspector panel as well, but the value is hidden. Simply click on the arrow next to its property name. You can even add new items to it by changing the Size value. So, at this point, you should have a basic concept of how scripting works in Unity. 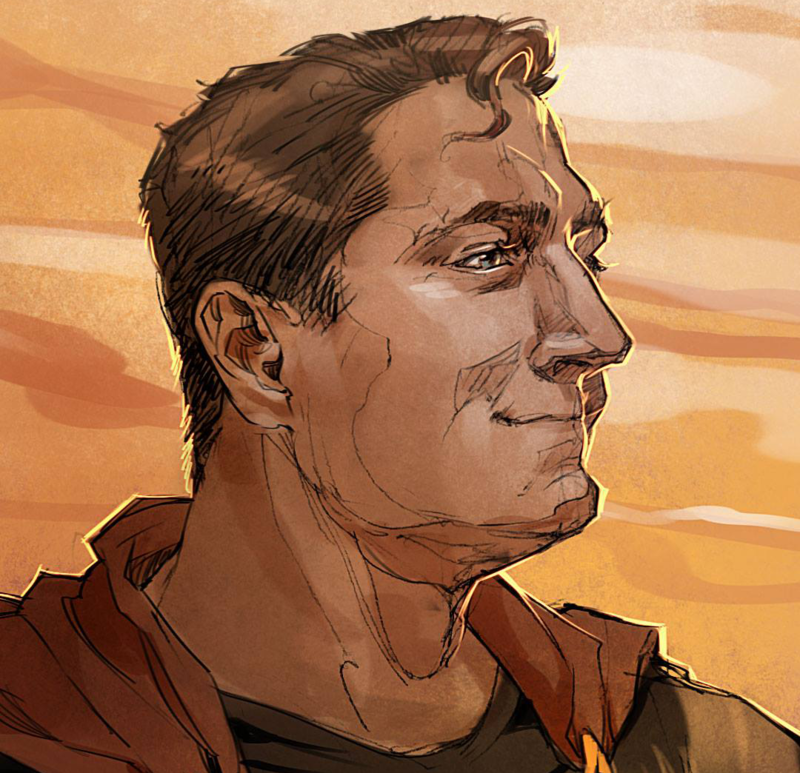 Everything we covered here will be re-introduced in the following chapter. There is just one last thing I want to cover, which is how to think through scripts for GameObjects. If you come from a traditional computer science background or have worked with other object-oriented programming languages before, you may be familiar with the argument on composition over inheritance. One of the cornerstones of OOP languages is the concept of polymorphism. While inheritance plays a large role in game development, Unity strives for the use of composition as much as possible. I consider scripting in Unity to follow the decorator and component design pattern. Each script adds additional functionality to your GameObject, but they are mostly self-contained. While some scripts rely on others to function, as we will see in the game we end up building, we really strive to create small, reusable blocks of code that can be applied to multiple GameObjects. When put together, each of these smaller scripts build up to a greater set of logic that builds up the functionality of each GameObject. While inheritance is possible, I strongly recommend thinking through composition as a means to not only create more modular, self-contained code but to also separate and encapsulate independent game logic. This kind of thinking is critical when it comes to grasping the true power of creating scripts in Unity. By now I am sure you are itching to get into more coding, so start playing around with some of the great tutorials out there on Unity. 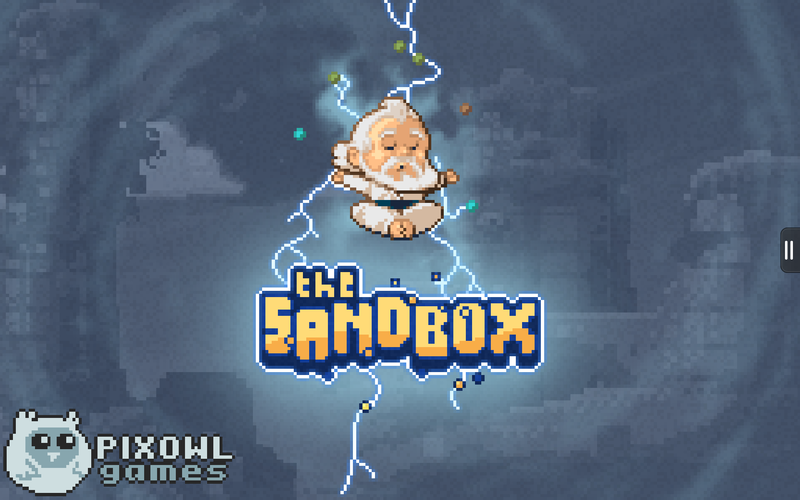 We’ll continue to add new posts about Unity, especially with working with the new 2D workflow, over the next few months so make sure you keep checking back. Also, don’t forget that to checkout Amazon’s GameCircle plug-in for Unity to help you integrate cross-platform leaderboards, achievements, and game data synchronization. The plug-in works on iOS, Android, and Fire OS plus with the built-in Whispersync for Games component you can back up all of your user’s game data to the cloud across all three platforms. You can now download it from the Scripting/Integration section of the Unity Asset Store. 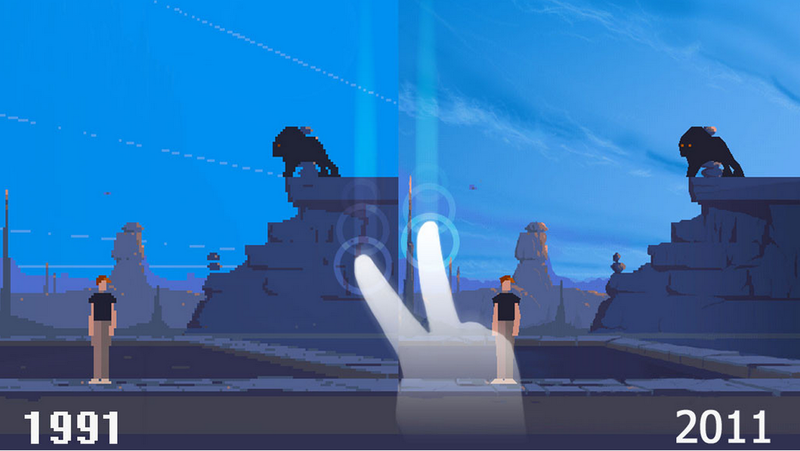 DotEmu is a Paris based company that specializes in breathing life into classic games on modern platforms founded by Xavier Liard and Romain Tisserand. After being established in 2007, they quickly made a name for themselves as a developer with well received ports of games like Square Enix’s Final Fantasy VII and VIII for Steam, SNK Playmore’s titles such as Metal Slug 1,2,3,X and King of Fighters 97. More recently, DotEmu became a publisher as well and released popular brands such as Double Dragon, Another World, R-Type and Raiden. 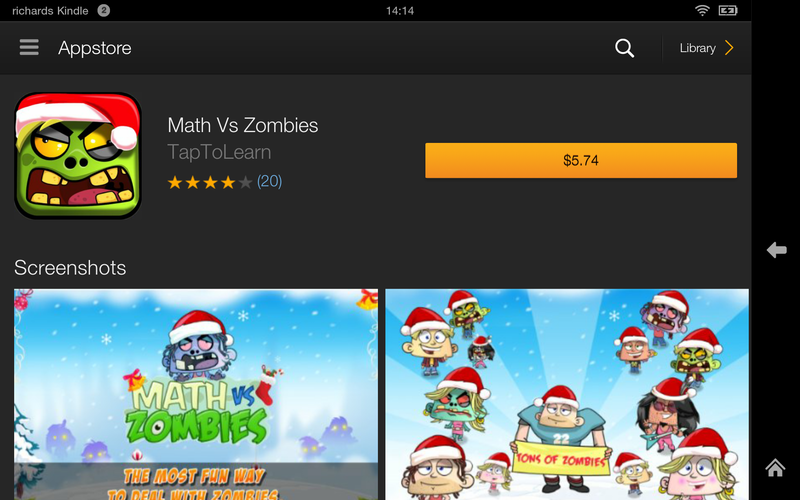 They have been moving to mobile and chose to publish their Android based ports on the Amazon Appstore. I was a huge fan of these games growing up so getting the chance to find out how DotEmu was finding success on the Amazon Appstore was a personal thrill. 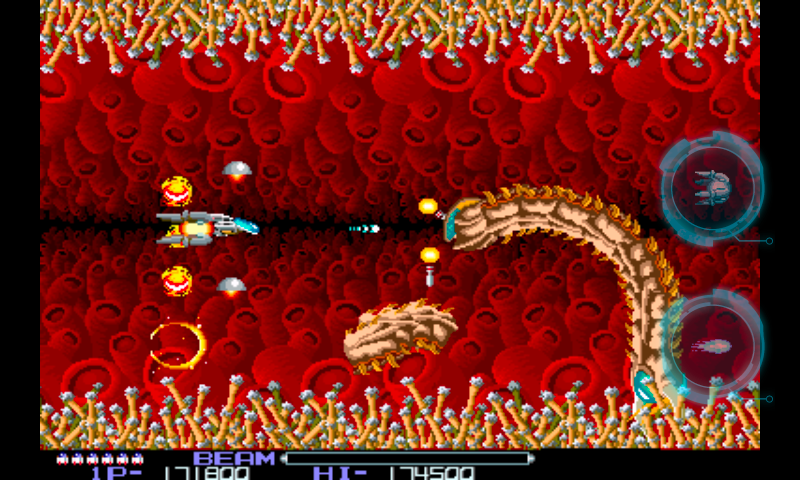 DotEmu’s first game in the Amazon Appstore, R-Type, quickly reached the number #2 spot on our best-selling apps list. While DotEmu has had similar success on multiple platforms such as iOS, Android, Desktop and more, they said “we consider Amazon as the best alternative to Google Play in terms of revenues for the Android platform.” Now with seven games in the store including Double Dragon Trilogy, Raiden Legacy, Another World and The Last Express they are continuing to release just what classic gamer fans would love. 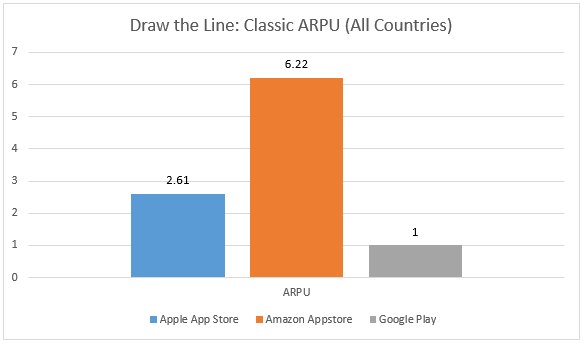 With so many games being released for the Amazon Appstore, DotEmu tackled the problem from the top down. 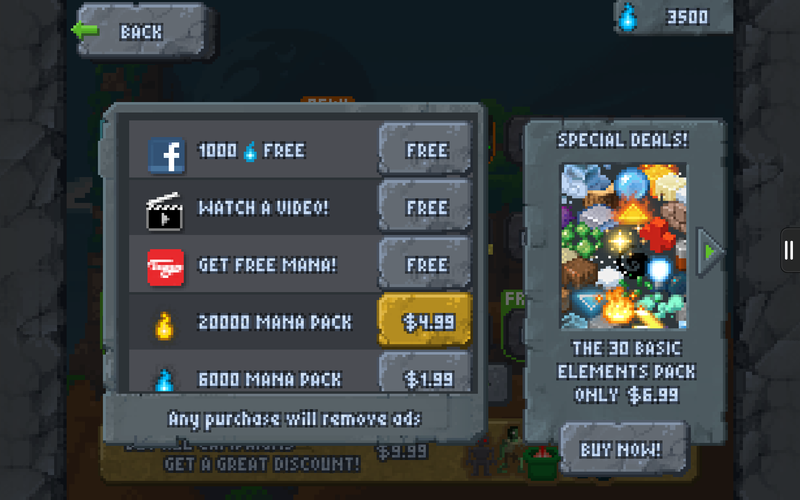 “From a business perspective we needed to make sure all the costs associated to the publishing of our games on Amazon were below the revenues we could expect.” But this all comes down to an important question on how you can manage the time investment for supporting a new platform like Fire OS and maximize the return on investment (ROI) at launch. 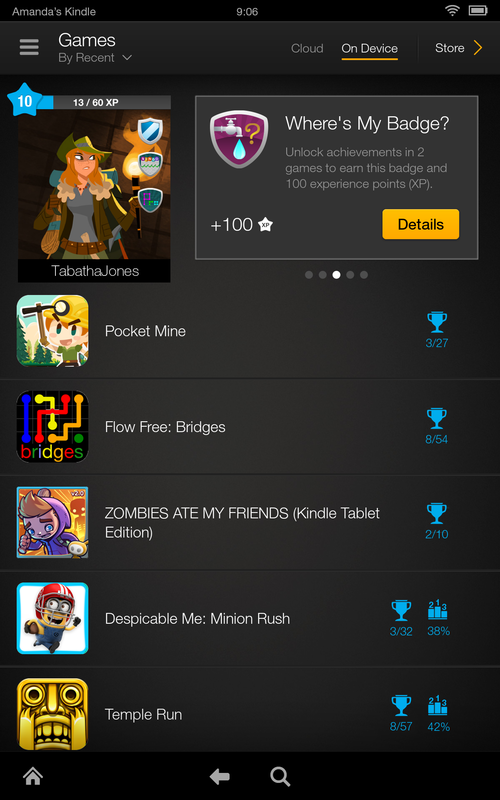 DotEmu’s Android games are built with Cocos2d-x on top of their own custom technology with features to handle multiple achievement/score API support, controllers support and more. When approaching the way to integrate Amazon’s GameCircle API into their existing codebase, DotEmu took a forward thinking approach. They spent the time upfront to integrate the GameCircle API correctly into their framework. 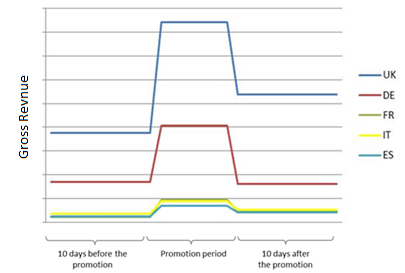 While this integration initially took them two weeks for their game engine, it now takes only a few days per game thanks to the effort they initially invested upfront. With this quicker development time plus an additional 1-2 days of QA time for each new port, DotEmu can now easily bring additional games over to the Amazon Appstore that offer the extra features that GameCircle provides. After receiving a few thousand purchases per game released on the Amazon Appstore, DotEmu is already seeing a return on their time invested. That means moving forward, any additional release with GameCircle support is immediately profitable after launch given the upfront work the put in early on. 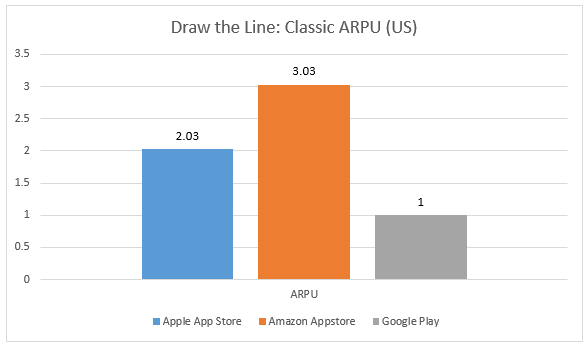 But there’s more to being successful in the Amazon Appstore than just the time that goes into integrating our APIs. Marketing your game in the store makes all the difference and DotEmu took advantage of working with our editorial team to create the biggest impact they could at launch. “Amazon is [a] very efficient [way] to advertise our games to the gamers liking retro games.” said DotEmu. In addition since the team didn’t require much help with the porting process, they were able to focus more on the marketing side things. The good news is that this sort of help form Amazon isn’t reserved for top publishers. Any developer can apply for our Free App of the Day (FAD) promotion to work directly with us to help promote your game and gain brand awareness once you are accepted into the program. So how did the team do? 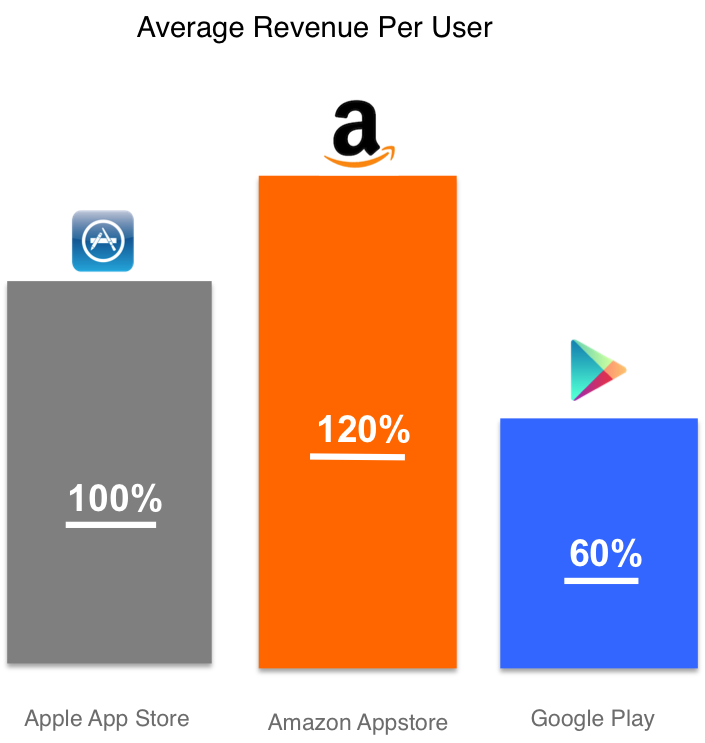 According to DotEmu, they “generated between 10.000€ and 50.000€ of net revenue on the Amazon Appstore in total”, all of which came from premium priced apps (as opposed to in-app products or advertising). Of course it helps to have a game with a recognizable brand for customer loyalty but it also depends immensely on the quality of the end product. The experience has been a success for DotEmu as they received a positive return on their investment in getting their first game into the Amazon Appstore. By taking the time to implement Amazon’s GameCircle APIs in a way that supports future projects they can now release games with deeper integration on the platform and continue to increase their ROI. 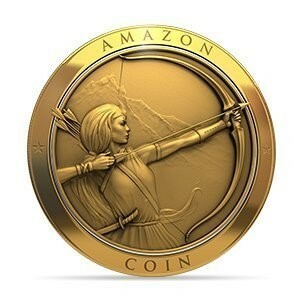 “The way to be successful with Amazon is to really think about long term business relationship and not to just release one game and pray for results without any support from the Amazon team.” according to DotEmu. This way of thinking is true about any platform, not just ours. The audience for retro gaming is growing in the Amazon Appstore and with the help of great partners like DotEmu we are helping expand that category and open it up to our user base. We can’t do it without more great games like the ones being produced by DotEmu so keep them coming and take advantage of our platform’s unique APIs such as GameCircle as well as marketing opportunities like FAD to help grow your audience. Screenshot from Another World on the Kindle Fire. According to DotEmu “Today getting noticed in the digital world is extremely difficult and we can bet it will be more and more difficult in the future” which is why they also went on to say that “building up a long term business relationship with Amazon is consequently a no-brainer”. We recently released an update to the Amazon Mobile App SDK that includes improvements to GameCircle and some related components on both Android and iOS. It updates GameCircle’s dependency on the latest version of Amazon Insights, corrects a few bugs, and expands API coverage of the Unity3D plug-in. For all of these reasons, we recommend migrating to the latest SDK when convenient. Both GameCircle and its Unity3D plug-in now take advantage of the latest version of Insights, part of Amazon’s Analytics service and the piece responsible for generating Achievements Reports. Insights SDK on iOS removed a dependency on CoreTelephony.framework, while the Android version corrected an issue specific to certain device Locales and improved support for other IAP frameworks. In addition, session timeouts now behave more consistently across platforms. Check out these latest changes to the SDK, and watch this space or future updates. We’re always working to improve performance, usability, and reliability of our services for mobile apps and games. Amid all the hoopla around GameCircle’s expansion to iOS and a major update to Whispersync for Games, you may not have noticed two other powerful features were also released recently. The GameCircle team quietly added support for bulk creation of leaderboards and achievements on the Mobile App Distribution Portal, as well as the ability to internationalize them in up to eight languages besides US English. Both have been popular feature requests. You enable these alternative versions by selecting them from the Add a Language dropdown list on the Leaderboard or Achievement view for your game. To view your game’s leaderboards, for example, go to the GameCircle configuration page and follow the View link in Leaderboards column. Adding an additional language is not reversible, but you specify which ones to publish, so there’s no harm done if you change your mind or add the wrong one: simply don’t publish that version of the title and description. 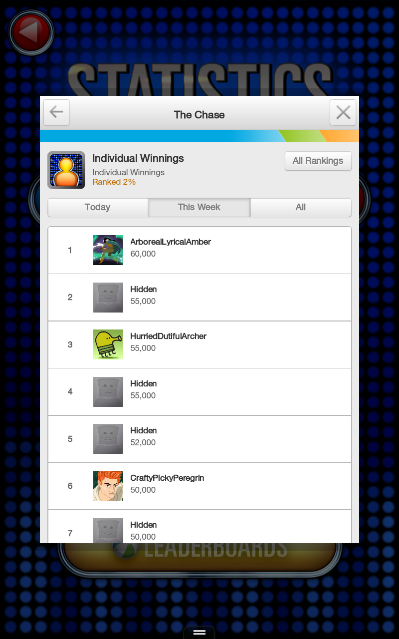 Once you add a language, you will see a new corresponding line item for each leaderboard or achievement, which is independently editable. Providing alternative versions for each title and description, while straightforward, may become unwieldy when you are translating for a lot of locales, or just have lots of leaderboards or achievements. In fact, as the number of leaderboards and achievements goes up, entering all of the other information required to create them definitely makes manual entry time-consuming. This is where GameCircle’s new bulk upload facility becomes really handy. Rather than create each achievement individually, for example, you can create a file of comma-separated values (CSV) defining all of your achievements at once. 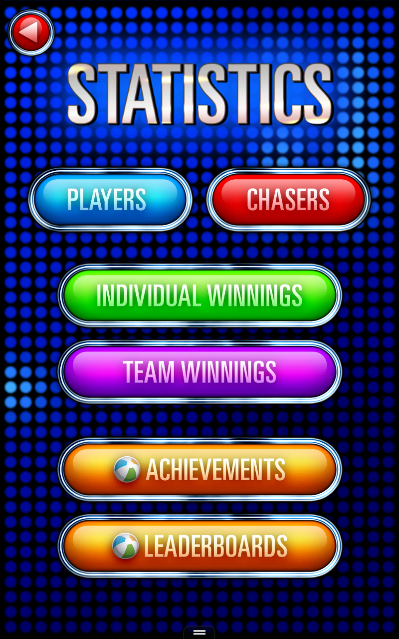 From the list of Achievements for your game, click the Bulk Add Achievements button. On the page that appears, download a CSV template via the click here link. Open the template and fill in the columns as appropriate, then save it locally. 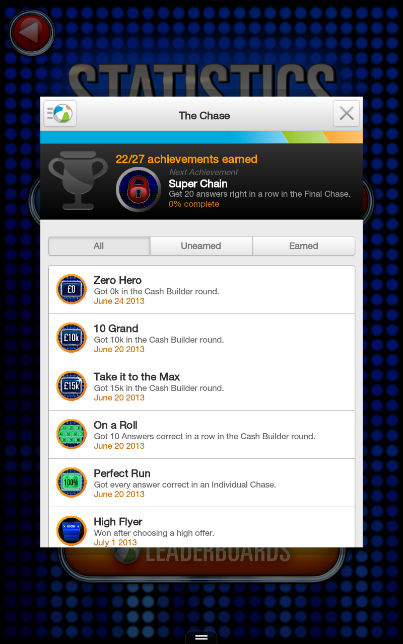 See the Create Multiple Achievements section of Implementing Achievements for more information on each column. You will notice, for example, that there are separate columns for each possible translation of title, locked description, and unlocked description. 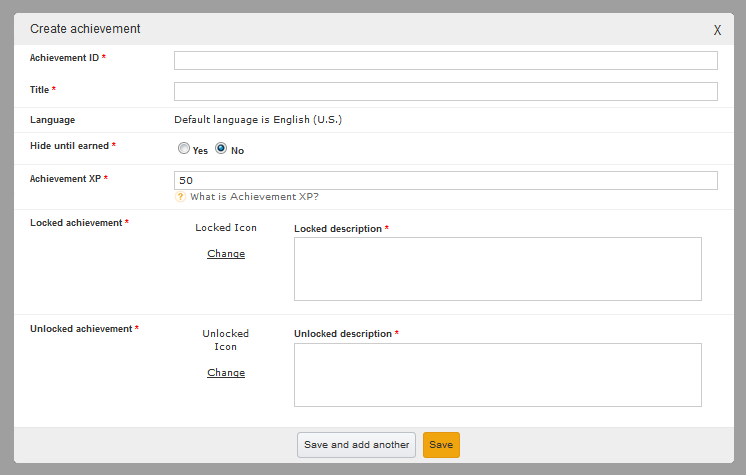 Icon ids for locked and unlocked versions of the achievement are shared across all languages. Before you can upload the CSV file defining your achievement (or leaderboard) metadata, however, you must upload the icons it refers to. GameCircle provides an Icon Gallery for this purpose, which allows you to add, delete, and rename icons individually or by dragging and dropping them on a web page. 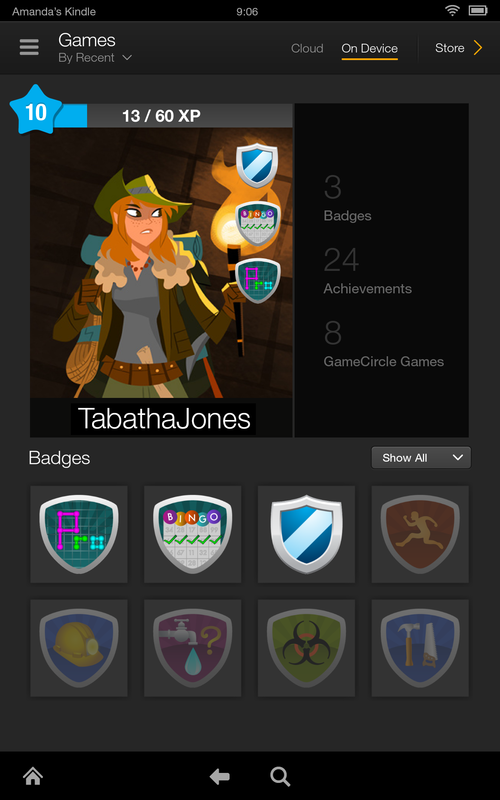 You can view the Icon Gallery for your game from the GameCircle configuration page. See Using the Icon Gallery for more information. Once the icons have been saved and the CSV file updated to reflect your achievement metadata, you’re ready to upload. Click Choose File and navigate to the file you just edited, and then upload it. Mobile apps and games distributed through the Amazon Appstore for Android are available in nearly 200 countries worldwide, and now GameCircle allows you to provide title and description translations for several of them. Entering the metadata that defines your achievements and leaderboards also got easier, now that you can upload it as a CSV file. Added in response to developer feedback, these features were designed to complement each other and make working with GameCircle fast and simple.